In 5 days time 18 sailors will leave Les Sables-d’Olonne in Western France to circumnavigate the globe. A journey of 30,000 nautical miles, they must travel alone, non-stop and without any outside assistance, that is to say without any modern technology or the benefit of satellite based navigation equipment. As if that wasn’t challenging enough they have to sail in a similar vessel to those that took part in the Sunday Times Golden Globe Race some 50 years ago. The Sunday Times Golden Globe Race 1968-1969 was the first round the world yacht race. 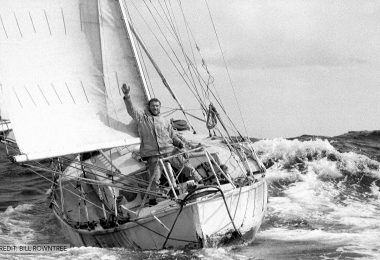 It was a very controversial race, of the 9 yachtsmen that took part only one finished the race, our very own Robin Knox-Johnson. To celebrate his achievement of becoming the first solo yachtsman to circumnavigate the world, the Golden Globe Race was born. Today’s skippers will have a very different challenge to the other skippers that compete in the many circumnavigation yacht races that are so popular today. Without the use of electronic navigation aids and instruments, (yes that’s right, no computers, GPS or satellite phones here) they will be using a sextant and paper charts to navigate a route around the 5 great capes. They will have to become expert on reading the weather, no shore-based reports for them and communication with the outside world will be very limited with only occasional calls to loved ones via long-range high frequency radios. The boats that are allowed to race in the Golden Globe Race 2018 are a world away from the IMOCA foil-equipped 60 foot monsters we now see Alex Thompson racing in the Vendee Globe Race. He has 60ft of ocean protection just ladened with safety and survival equipment. In the Golden Globe Race the skippers can only bring along production yachts with a length of between 32ft and 36ft overall (9.75 – 10.97m). They must have been designed prior to 1988 and their keel must be full-length with the rudder attached to their trailing edge. That’s half the size of the boat that Alex uses for his keel walks and without an ounce of carbon fibre in sight. The record for a solo circumnavigation of the world currently stands at 42 Days, 16 hours, 40 minutes and 35 seconds. This was set by French skipper François Gabart aboard his 100-foot trimaran in December 2017. Armel Le Cleac’h holds the record for sailing solo around the world in a monohull. He made it in 74 days and 35 minutes whilst taking part on the Vendee Globe Race 2016/2017. Sunday’s competitors are looking at around 300 days at sea. Can you even begin to comprehend the amount of provisioning that is going to need. For more information on the Golden Globe Race 2018 visit the race site. There is a live tracking system on the site so we can follow the brave skippers as they race around the world. If you want to know more about the Sunday Times Golden Globe Race a good book to start with is “A Voyage for Madmen” by Peter Nichols. A cracking read, I would throughly recommend this book even for those with less salt in their veins. It tells the story of the events of the inaugural race. 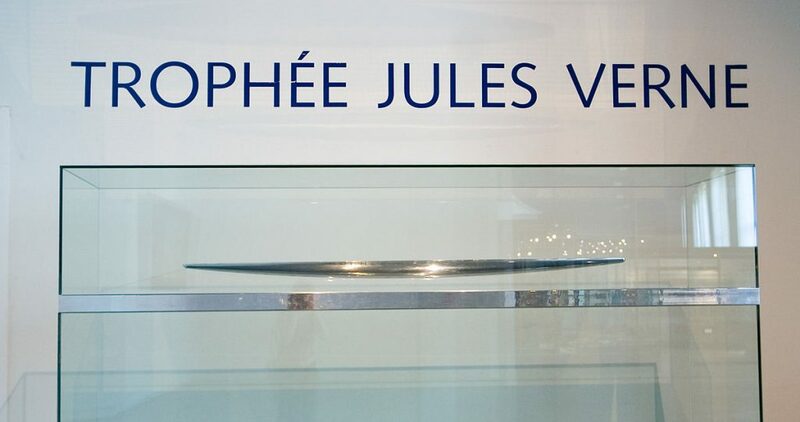 Named for the author Jules Verne, who, in 1872, sent his protagonist Phileas Fogg off around the world in an attempt to circumnavigate it in 80 days or fewer, the Jules Verne trophy is one that quickens the pulse of any sailor, no matter their age. In the author’s day, the technology that could propel any form of transport non-stop around the globe within the specified time frame did not exist outside the pages of his book. Almost one hundred years later, in 1985, when a group of sailors gathered for an evening celebrating a successful transatlantic crossing, the idea of an unbroken circumnavigation of the globe – 26,000 miles – by sail power alone still seemed only slightly less audacious. Nevertheless, an idea, and a challenge, was born.The trophy differs from other sailing challenges in that it is open to any type of yacht, crewed by any number of sailors. The only stipulations are that the vessel is registered with the Jules Verne trophy organisation and the requisite fee is paid. Crews making the attempt sail from east to west around the globe, starting and finishing the race by crossing an imaginary line at the entrance to the English Channel that runs between Lizard Point in the UK and Ushant Island in France. During the challenge they must pass the Cape of Good Hope, Cape Leeuwin and Cape Horn, all of which, as any sailor knows, are situated in some of the most dangerous waters in the world. Winners of the trophy receive no financial reward. Aside from personal pride and professional approbation, the trophy itself is the prize. It takes the form of a sculpture of a boat’s hull on a magnetic field, with the sailors’ names engraved on an aluminium base. The Paris Musée Nationale de la Marine is the caretaker and exhibitor of the trophy, with winners being given a small magnetised replica. This follows a formal ceremony in which the new record holder places the trophy’s hull into its magnetised mooring. Back in the 1980s, the trophy was a challenge to boat designers and sailors alike. Both rose to the occasion. The first holder of the trophy was the Explorer, a Catamaran, skippered by Bruno Peyron, which managed the feat in 79 days 6 hours 15 minutes 56 seconds. As of March 2017, there have been nine holders of the trophy, and considerably more failed record attempts. The IDEC Sport, skippered by Francis Joyon, is the present holder. The vessel completed its circumnavigation in January 2017 after 40 days 23 hours 30 minutes 30 seconds at sea. Although promising an adventure like no other, the trophy has not been without controversy. In 2004, for example, Steve Fossett broke the previous record in the Catamaran, Cheyenne. He never received the trophy. Reports suggest that the organisers charged him a higher entry fee than other competitors, which he refused to pay. Controversy aside, in an age increasingly hedged with safety concerns and restrictions, and where there is little fresh ground for would-be adventurers to tread, the Jules Verne trophy is a summons that many sailors still find themselves heeding with excitement, trepidation and no little hope. Lovesail.com is an niche online dating and social networking site for sailing enthusiasts. Wht not take a look at our site today and join to meet like-minded single mariners. The annual Round the Island Yacht Race is organized by the Island Sailing Club. Since 2005, it has been sponsored by JP Morgan Asset Management. Beginning and ending in Cowes, the date that it takes place depends on the tides. It is usually held during the month of June, although it may be held in late May or early July if the sea refuses to cooperate with the traditional timetable. This year, the Round the Island Yacht Race will be held on 21 June 2014. It will begin and end at Cowes. The event is expected to attract around 16,000 sailors and more than 1,700 vessels. Whether they are watching in person or via the live commentary on the website, spectators will have the opportunity to watch world class racers in action. Most craft will take several hours to complete the course. The current record for a multihull boat is held by Sir Ben Ainslie on JP Morgan BAR in 2013 and stands at 2 hours, 52 minutes and 15 seconds. For a monohull craft, the current record is three hours, 43 minutes and 50 seconds, set by Mike Slade on ICAP Leonard, also in 2013. The first race took place in 1931 with 25 entries. It was run at the suggestion of Island Sailing Club Member, Major Cyril Windeler, who proposed an event suitable for craft in the 5 to 25-ton category. The Gold Roman Bow, as the trophy is known, was lifted by Peter Brett, who competed in a 22-foot Cornish fishing boat he purchased for £45. Two years later, the 1933 race was punctuated by drama when the Rosemary IV, leading the race under Isaac Bell, lost her mainsail right before the finish line. The crew frantically raised a trysail and finished 46 seconds ahead of the Felise. Not far away, the Enid, a 32 year-old cutter captained by Dr RT Cooke, sprang a leak and ultimately sank off Alum Bay, near the southwest corner of the IOW near the delicate rock formation known as the Needles. The race provides an opportunity for spectators to donate to the official race charity, the Ellen MacArthur Cancer Trust. Supporters may also sponsor their favourite crew via the JustGiving website. The Middle Sea Race is a yacht race which starts and finishes in Malta. The 606 nautical mile course will start from the Grand Harbour, beneath the saluting Battery. The fleet then head north along the eastern coasts of Sicily up towards the Straits of Messina. Once through the Straits, the course leads north to the Aeolian Islands where the yachts then turn west to the Egadi Islands. Once past Lampedusa the fleet turns north east on the final leg towards the South Comino Channel and the finish at Marsamxett Harbour. The middle sea race course record is 47 hours 55 minutes and 3 seconds established by Rambler (USA). Over 100 yachts are expected to take part in the Middle Sea Race, with the favourite being Hasso Plattner’s Z-86 Morning Glory. Others in the running include Alex Thomson’s IMOCA 60 – Hugo Boss, Spanish IMOCA 60 Gaes, however, both these yachts will be racing double handed rather than fully crewed. Andy Budgen’s Volvo 70 – Monster Project, Andres Soriano’s latest, Alegre, is a Mills 72 and significantly quicker than Soriano’s previous yacht and lastly JV72 Robertissima II, skippered by Vasco Vascotti should have a close battle with Alegre. For more details on the Middle Sea Race visit the Rolex Middle Sea Race website. Lovesail.com is a global on-line dating and social networking site for sailing enthusiasts. Join and meet liked minded sailors for sailing trips, social events and sailing dates.